The Neighborhood Plan created by Belmont Shelter calls for the construction of a 'clubhouse' on Michigan Avenue near Best. Here's the sketch. It was explained to me that the 'clubhouse' would serve as a place for residents to do laundry and hold planned activities in the neighborhood. While access to laundry machines is certainly essential in any neighborhood, can it really argued that the quarter-million dollars being spent to house four laundry machines and a "community room" represents the highest use of public resources? Is the use of this quarter million dollars really being used imaginatively to the maximum benefit of the neighborhood? Say for instance, this 'clubhouse' concept, which reminds one of the obligatory "community rooms" set up near public housing projects in the 1950s, were revamped? If you were a public official tasked with spending $250k to create a community amenity, is this "clubhouse" how you would spend it? Take this building, for example: the former Joseph Denzel Tavern at 1325 Michigan - a few short blocks away from the planned 'clubhouse.' Could this become the sort of entrepenurial space that would help build a real community? The opportunity is so obvious. Why is it being ignored? Imagine if you were handed a check for $250,000 for something other than housing, a few blocks from Main Street for the purpose of helping to restore and rebuild a neighborhood. What's the best use of these funds - xeroxing a 'clubhouse' into the neighborhood or renovating of one of the neighborhood's last remaining heritage commercial buildings. Take a look at the rest of the plan when you have a moment. Dip into the comment stream and let me know what you think is best. I stopped by City Hall this afternoon and picked up a copy of some of the site sketches for the East Side Housing Opportunities plan that I've been posting about recently. 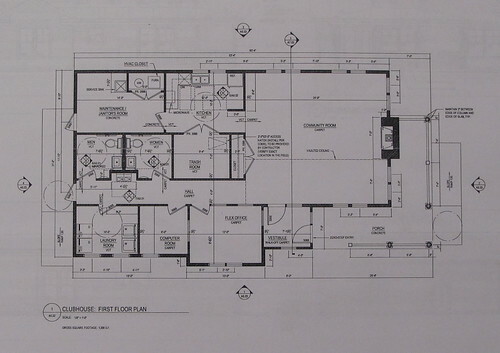 This house is planned for Ada Place as I wrote about yesterday. 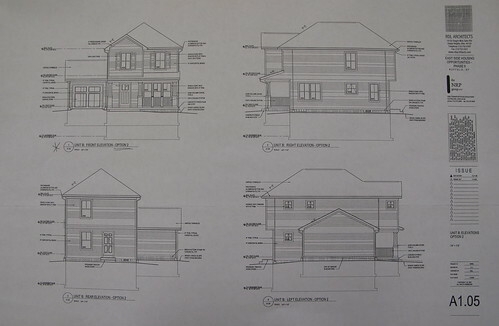 This new house will occupy three existing empty lots and have a setback that's completely out of character for Ada Place's compact street scape. After talking with a number of people in the Planning Department at City Hall this afternoon, I learned that there may be some room in the plan to shift the house closer to the street. I hope to have an update about this soon. I took a closer look at Belmont Shelter's Neighborhood Plan and walked over to Ada Place the other day. Standing at the north end of Ada - first pic below - I noticed that Belmont Shelter has staked out plans for the first house. 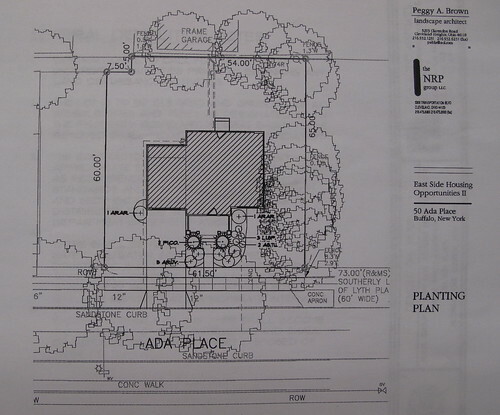 According to their plan three existing lots will be combined into one at 50, 52 and 54 Ada. The houses on Ada Place, one of the most compact streetscapes in Buffalo, are often a stunningly narrow 14' feet in width on 21' wide lots. 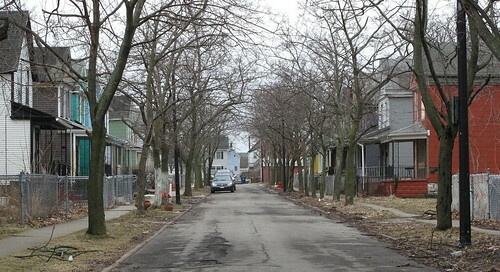 The uniqueness of this urban scene is its most compelling economic resource - something which appears to be ignored entirely by Belmont Shelter and its City sponsors. Perhaps the only corollary to Ada Place is Coe Place, adjacent to Artspace, where a very similar compact block is gradually being rehabbed by home owners who recognize the value of its colorful, compact, urban character. The same could happen on Ada Place - that is, if more of its delapidated and high potential historic properties are saved and silly suburban houses do not replace them or destroy its interesting character. Currently, six of these houses are abandoned, boarded and vacant - ready for rehab. Belmont is assembling over 100 lots from the City and plans to build 49 new rental houses and a 'clubhouse' - on Michigan, near Best Street - as part of their new neighborhood plan. The consequence here is that the neighborhood's former density will be damaged. The potential advantage of maximizing our earlier half-billion dollar investment in light rail rapid transit is not reinforced. Advocating and developing a market for lower density, 'suburban style' and car friendly design is exactly not what was intended when the City's subway was built. Where's the vision? Rather than reinforcing good urban design principles and strengthening the neighborhood, we settle for less - again. Why? One of Midtown's most well known landmarks - Freddie's Donuts - is headed to the landfill. 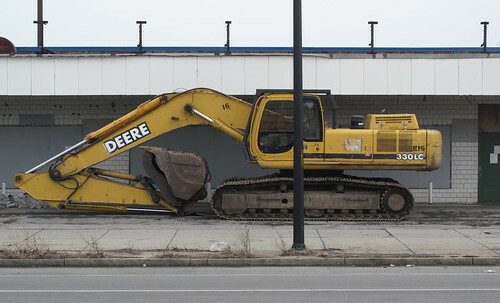 I spotted the wrecker in front of one of Buffalo's best examples of roadside architecture over the weekend. A recent post - Remember Freddie's? - gathered a number of comments from fixBuffalo readers about this favorite place along Main Street near Michigan Avenue. According to one local planner that I spoke post demolition plans for the site aren't known. He surmises that it'll be another shovel ready site. I've just placed this blog's comments into moderation mode due to a high level - 50/hour - of spam comments I've been receiving from an IP registered to someone in China. Once this cyber storm subsides I'll return the comment stream to the previous status. Sorry for any inconvenience. According to Paul McDonnell - the archictect for the Board of Education and the City's liasion between the board and the Joint School Reconstruction Project - the cold and snow slowed construction here at City Honors for a short period this winter. 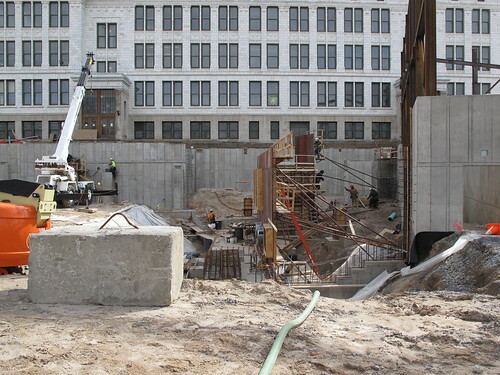 Despite the weather, work is once again on schedule for the anticipated September 2010 completion. Here, the structural steel for the school's new natatorium is beginning to take shape. 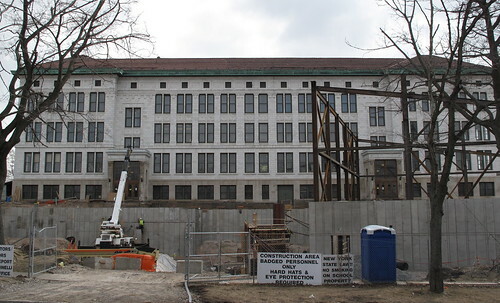 The $1B Joint School Reconstruction Project is the largest construction project in the city's history. LPCiminelli is the project manager and their site - Buffalo Public Schools Program - provides additional information about the project's scope. Arts and educational funding have been a vital link in this neighborhood's reemergence. The $40M for City Honors is part of the larger $100M strategic investment in Midtown. The other projects include Artspace, Performing Arts HS and the City's newest public library, the Merriweather - at the corner of East Utica and Jefferson. The March 9th e-newsletter from George Grasser and the Partners for a Livable Western New York is available right here. An archive of previous issues is also available. 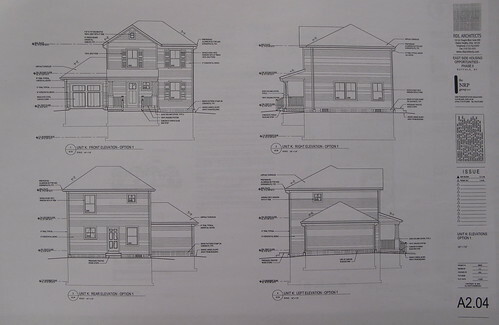 Two weeks ago Belmont Shelter announced plans to build 50 "rent-to-own" houses in Buffalo's Cold Springs neighborhood. Here's the Buffalo News announcement. The $12.1 million project scatters new houses over two council districts over an area of about 60 square blocks, combining more tightly-knit urban lots into larger suburban ones, all within blocks of a half-billion dollar transit system that depends on proximity to a dense neighborhood. The suburban style houses come at a hefty price - a stunning $240k per house. Here's the site map. The smaller images below, provided by Belmont Shelter, show the exact locations of the proposed new builds. 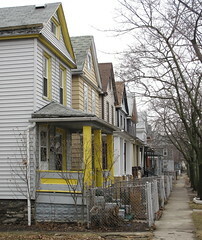 There are dozens of houses here in Belmont's target area that are part of the remaining historic neighborhood fabric. As these houses are being proposed, dozens of historic properties in Belmont's target area - the kind of houses that add value and could retain residents over the long haul - continue to decay. These houses can and should be saved. Neighborhood revitiliztion on a national scale is not being led by the construction of 'vinyl victorians', it's being led by the other model Belmont has embraced - the reconstruction of historic homes such as the Hamiltion Ward House at 19 Coe Place. Neighborhoods in every city in America that are experiencing revitalization are doing so because of the economic development resource of character buildings. Belmont should be challenged to name any district in America that has benefited from scattershot suburbanization in historic neighborhoods. If Belmont concentrated on its own precedent, performing restorations of character buildings like the Hamilton Ward House at 19 Coe Place, all over Midtown and Cold Spring, the impact would be transformative. fixBuffalo readers may remember that Belmont Shelter purchased the Hamilton Ward House on Coe Place with the intent to demolish it and enlarge their parking lot. Through a combination of efforts - 'friends of Coe Place', a series of posts and an Artvoice cover story - 7/2006 - Belmont Shelter reveresed its decision. They've completed what is an amazing renovation - right here - that contributes to the streetscape and character of the neighborhood. This has helped attract new investment. If struggling communities don’t preserve their architecture, there’s no chance of any resurgence down the line. What makes Midtown unique is the architectural character and unique personality. Building suburban houses on large lots like the ones proposed not only do not help, they make the neighborhood worse by destroying the personality and character of the neighborhood which is its most compelling economic asset. It saps the potential and undermines the character of the neighborhood. Midtown: Poised for Renaissance, written by Chris Hawley (for the City of Buffalo), looks at the assets of this neighborhood and draws a set of conclusions that vastly differ from Belmont's plan. Hawley recognizes the necessity of restoring the neighborhood's historic building stock and deemphasizes the suburbanization of the neighborhood as undermining its character and economic potential. It's the City's own plan. Why isn't it being followed? 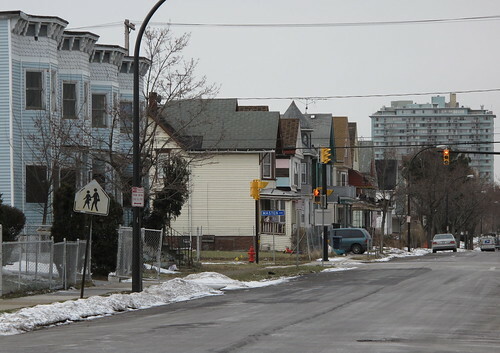 While discussing Belmont's proposal with Jeff Brennen, local green contractor, Jeff remarked, "It appears as though Belmont Shelter is strictly concerned with their mission and not the what is good for the City of Buffalo and its neighborhoods long term." Drilling into the the individual site plans and taking a closer look, the new builds will occupy a footprint that incorporates two parcels, sometimes three. While this may seem necessary to satisfy current building code requirements, it isn't. They have a right to build on existing lots with a preexisting residential use by right - the old lots are grandfathered in. The proposed plan further reduces the possibility for density just blocks away from one of the city's most amazing assets, the subway. Residential proposals that rely on suburban style footprints endorse a car culture and reduce the possibility of achieving the sort of density that make neighborhoods thrive. The City's Planning Board is expected to approve Belmont's proposal tomorrow morning during their bi-weekly meeting on the 9th floor of City Hall at 8am. Belmont Shelter's phone number is 716-884-7791. 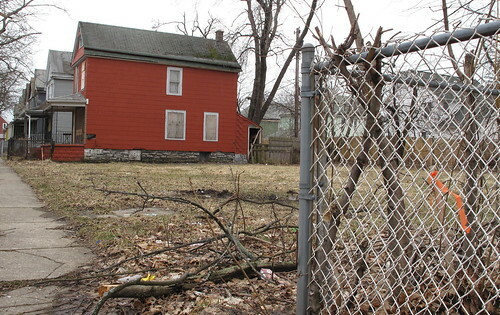 What happens when 1 out of 13 houses in your city is abandoned? In today's New York Times Magazine - All Boarded Up by Alex Kotlowitz- tells Cleveland's story. 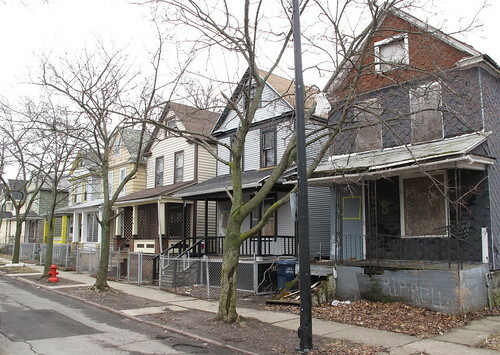 Officials in Cleveland are grappling with at least 10,000 abandoned homes, many owned by lenders or speculators who trade them like baseball cards. Buffalo NY is grappling with vacancy and abandonment and has a higher percentage of vacant property than any other city in the country, except St. Louis. The foreclosure crisis in Cleveland and how it intersects with banks not completing the process and re-taking title to a house as described in today's New York Times is not isolated to Cleveland. The same series of events plays out here in Buffalo everyday. Attorney Sheree Meadows specializes in housing issues and represents low income homeowners here in Buffalo, NY. She recently sat down with me and described dozens of stories dealing with some of country's largest banks in Housing Court. According to Sheree there are hundreds of cases in Buffalo where the bank or lending institution will initiate a foreclosure proceeding and never complete it. In the meantime, the owner will move out - fully expecting the bank to take over the property - and later after being summoned to Housing Court learn that they're still responsible for what's left of the vacant property. In such cases - Cleveland or in Buffalo - the residual value of the property has gone from being an asset to a liability. All Boarded Up is a must read if you're interested in knowing just how far public policy has to go to catch up to the existing reality of life on the streets in a city like ours. 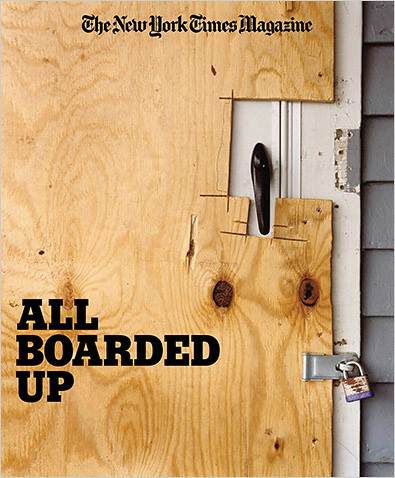 All Boarded Up is discussed over at Richard Florida's blog, right here. The 'Woodlawn Row Houses' were built in 1896 at a time when electric street lights were first installed in the Queen City. 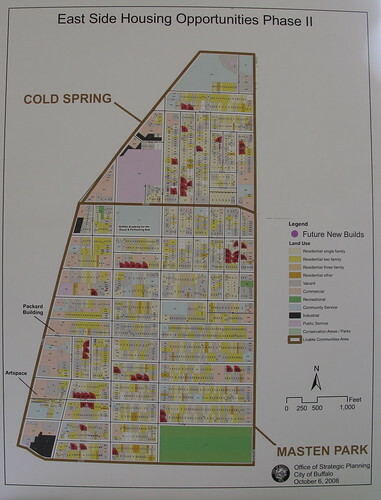 At the time they were part of a larger collection of row house developments in the Cold Springs neighborhood. Two and three story units dotted the street scape and were strategically located mostly on corners. Some of these 'rows' were wrapped in 'L' fashion around a corner. These structures (now demolished - 1997, despite 'local landmark' designation) at Laurel and Michigan were just one example. When I bought a neglected and vacant row house in the City's Cold Springs neighborhood 13 years ago I developed an interest in the remaining sets of row houses in the area. The Emerson Row and the Woodlawn Row (then occupied) were just a block away and were the last remaining row houses in the immediate neighborhood, a neighborhood that once contained 15 sets of row houses and maybe the largest concentration of this type of housing in the City - see map. Fifteen sets had dwindled to three. Yesterday I heard from Urban Development Partners LLC, the successful bidder at the September 22, 2007 special auction that the City held for a select list of properties. After a number of promising attempts at pulling together financing for this project, Jason at UDP told me the project has ground to a halt. They've bailed. fixBuffalo readers may remember this announcement from a year ago - Another Save... - where I'd announced that the Community Preservation Corporation had provided extensive financing for the rehabilitiation of the project. Located less than 100' from the new $35 million home for the Buffalo Academy for the Visual and Performing Arts, around the corner from the African American Cultural Center and a few blocks away from the new Merriweather Library the Woodlawn Row Houses were given 'local landmark' status by the City's Preservation Board in 1981. 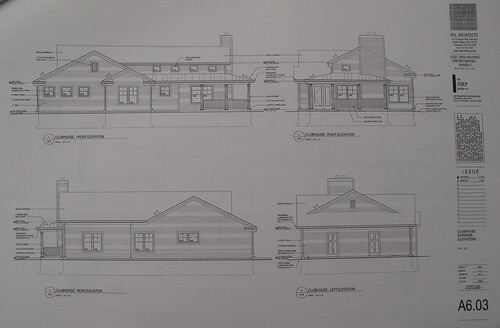 Located at 147 Woodlawn, the adjacent City owned vacant lot could be bundled with this project. 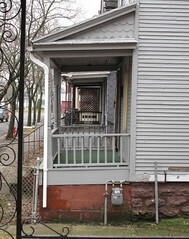 I began taking pics in March 2004 and documenting the long slow process of 'demolition by neglect' at this location. While taking dozens of people through the row houses over the years, the structures remain viable and the rehabiltion of this row remains a very real possibility. 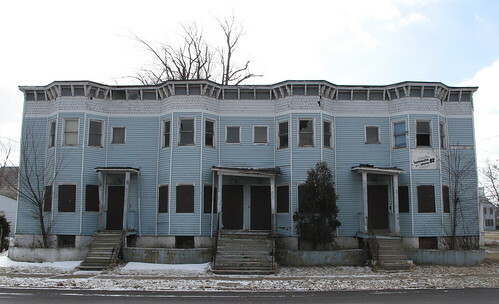 About 15 years ago the original four two story units were split and the long term owners turned the Woodlawn Row Houses into eight apartments. Over the last four years three different groups have stepped forward and have attempted this project. Everyone has tried to retain the current eight unit configuration. Perhaps a new strategy is in order here. Returning the structure to its original form - four units, removing the siding, doing a fun exterior paint job that would clearly indicate four seperate houses and moth balling three units while working on one - might provide the right direction for the 'diy' self-financed plan for the successful rehab of this unique spot. Moving slowly through the project might be the right mix of energy, resources and time to resucitate the Woodlawn Row Houses.